Mr. Granda, of Glenview Elementary in Oakland, California, was voted the Grand Prize winner in a contest hosted by StorageMart self storage. He will receive a $500 cash prize and over $3,000 in school supplies for his class and young Xavier, the student responsible for the drawing, will win a pizza party for his class. StorageMart self storage is pleased to announce the winner of the “Draw My Favorite Teacher” contest they recently hosted in Oakland, California. By the narrow margin of just 14 votes, Mr. Granda of Glenview Elementary is the Grand Prize winner. Runners up include Ms. Hackett (Peralta Elementary), Ms. Hilton (Hoover Elementary) and Ms. Davis (Martin Luther King, Jr. Elementary). 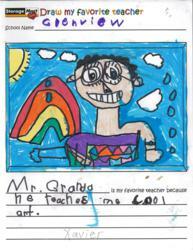 “Draw My Favorite Teacher” was open to all public schools (K-5) in the Oakland area. Submissions to the contest were in the form of drawings made by students of their favorite teacher, along with a brief description of what makes him/her their favorite. Finalists were chosen from more than 500 submitted drawings and then put to a public vote via StorageMart’s official blog, Storage Insider, and Facebook page. As the Grand Prize winner, Mr. Granda will receive a check for $500 to spend on his classroom in any way he sees fit. Glenview Elementary will receive a storage unit filled with school supplies valued at more than $3,000 and Xavier, the student responsible for the winning drawing, will win a pizza party for his entire class. The Grand Prize will be presented in a school assembly on Monday, December 10th, 2012. Each of the runners up will receive a check for $100 for use in their respective classrooms. While StorageMart has been awarding ScholarSmarts Scholarships for higher education for several years, this is the company’s first organized drive in support of education at the primary school level. “StorageMart has supported students seeking higher education through our ScholarSmarts program for several years,” said StorageMart Interactive Marketing Director, Sarah Little. “Extending that support to public school teachers is an honor to us. "The idea started when a teacher from a small school in New Bloomfield, MO approached us with a sponsorship opportunity to fund a smartboard purchase the school's budget wouldn't allow. I was inspired by this teacher's personal commitment to his students and the time and initiative he put into improving their education. There are teachers like him in every community, going beyond the call of duty because they want what’s best for their students. The ‘Draw My Favorite Teacher’ contest was created because we wanted to give back to teachers and at the same time enable students to be the mouthpiece for thanking them." Due to the overall positive reaction from area teachers and school administrators and the volume of response to the online poll, StorageMart hopes to export the “Draw My Favorite Teacher” contest and similar promotions benefiting public schools in each of the markets within which the company operates. Headquartered in Columbia, Missouri, StorageMart is a full-service, self-storage company with more than 130 locations across the United States and Canada. StorageMart Gives is the charitable arm of the company, striving to identify partner organizations in each of the company’s home markets. For more information, please visit http://www.storage-mart.com.